calculatorcal‧cu‧la‧tor /ˈkælkjəleɪtə $ -ər/ ●●● S3 noun [countable] TMa small electronic machine that can add, multiply etcCOLLOCATIONSverbsuse a calculatorThe children are taught to use calculators from a young age.work something out on a calculatorWork it out on a calculator if you can't do it in your head.add something up on a calculatorI added the cost up on a calculator.types of calculator an electronic calculatorCandidates may use electronic calculators in the exam.a pocket calculator (=a small one you can carry easily)I took out my pocket calculator and added up the figures.a desk calculator (=a big one for using on a desk)He had a big fancy desk calculator.a hand-held calculator (=a small one that you hold in your hand)The calculations can be done using a hand-held calculator. 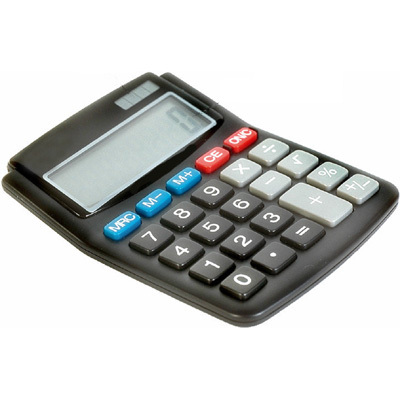 calculator• He instantly purchased everything the store had to offer -- some 100 calculators priced at $ 15. 60 each.• Instead they have calculated benefits using a calculator and storing files in manila folders.• When he had gone, she found her calculator and slipped it into her bag.• Sliding them on to the desk, she snapped open her briefcase and took out her calculator.• There were no computers, no calculators, and little experience with performance measurement, even in business.• Multiply the length by 2.7 using a pocket calculator and that gives the number of needles to use for seaming.• Later, electrically powered calculators and analog computers bridged the gap to the first primitive digital computers.• However, 11 different modes of assessment were noted, including mental, practical, calculator, project and investigative work.